Wayne, Pa. (December 15, 2017) —Dolco Packaging, a Tekni-Plex business unit, is once again supporting the Stockings for Soldiers campaign with volunteers from its Decatur, Indiana, manufacturing facility. Working with other organizations in Adams County, Dolco employees assembled hundreds of stockings that are being shipped to active duty military personnel around the world. “We appreciate their service and hope that the stuffed stockings help provide a little bit of home for the holidays. 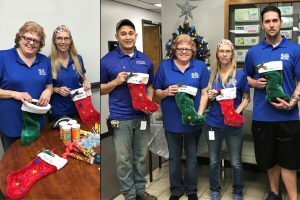 Donating time to volunteer for the Stockings for Soldiers campaign is just one more way for Dolco employees to give back to those that put themselves in harm’s way to protect American values. We are honored to have participated in this year’s campaign,” said Jim Baumgartner, Dolco plant manager. Dolco understands the value of workplace diversity. Its team includes veterans of military service (as well as relatives of service people) who bring to the job superior technical ability, excellent teamwork skills and a strong work ethic. Dolco Packaging is the leading manufacturer of polystyrene (PS) foam egg cartons in the United States. The company also manufactures PET egg cartons, PS and PET mushroom tills, PS apple and pear trays as well as industrial and custom packaging solutions for agricultural, food and food service markets. Dolco operates five manufacturing facilities across the United States. For more information visit www.tekni-plex.com/dolco. Celebrating its 50th anniversary in 2017, Tekni-Plex is a globally-integrated company focused on developing and manufacturing innovative packaging materials, medical compounds and precision-crafted medical tubing solutions for some of the most well-known names in the medical, pharmaceutical, personal care, household and industrial, and food and beverage industries. Tekni-Plex is headquartered in Wayne, Pennsylvania, and operates manufacturing sites across eight countries worldwide to meet the needs of its global customers. For more information visit www.tekni-plex.com.